**** with all this comments and complains on them and they still open ?? They should be close to preserve their dignity. No. I use a BMW Specialists. A mechanic, that has been trained by BMW originally, worked in a BMW garage but works for himself and is a BMW enthusiast himself. This guy takes care of my BMW mechanically and service wise. For bodywork and paint, I would never go to BMW. I go to a bodyshop, that I trust to get it right. Originally based on a recommendation that I can trust and since based on the experience with the work I've gotten done. Unbelievable. I was in process of shopping for a 550i M-Sport to come back to BMW after a brief switch over to Lexus. After this I think I will stay away for a few more years! This case is going to be difficult. It seems like a lot of it is your word against theirs. Unless you have accident scene evidence in an acceptable format, and witnesses who can corroborate the positions they took which sound egregious and would quickly alienate any jury. I agree with the other poster - if you can get a former employee (ideally the crash driver) to testify it will help a lot. The case is actually quite simple... The car was fine when it was dropped off at the dealer and then the dealer wrecked the car. I think the big dispute will be the amount of damages. Regarding BMW, unfortunately, it seems that BMW is really dropping the ball lately. I love my BMW but many of the turbo ones (including mine )have problems with their high pressure fuel pumps. I truly believe that these dealers only understand lawsuits, maybe....or just forbid them to test drive our cars. Last edited by bimmersrus; 11th October 2010 at 08:12 PM. 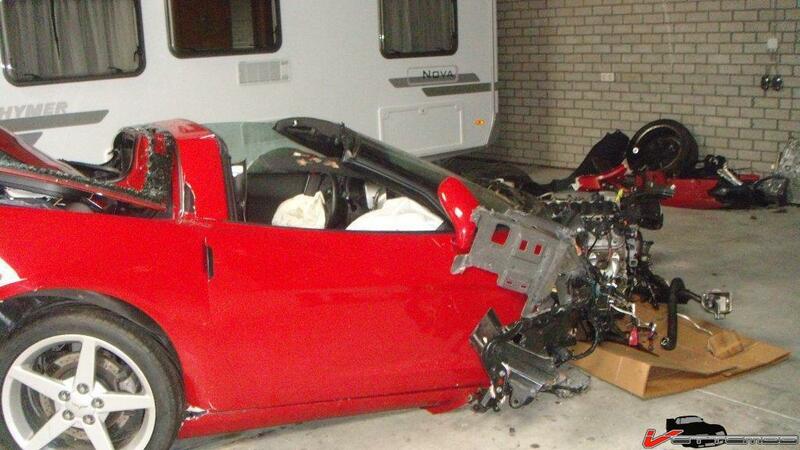 Now that was a very bad Corvetet crash. This is like the never ending story.........does anyone have the Cliff Notes on this adventure.??? -OP takes car to dealer for routine maintenance. -dealer cals OP, "hey we kinda dinged up your car, come on down"
-dealer tells OP "no big deal, some sand on the road, oops, only $2500 damage, most expensive thing is the wheel hardy har har"
-OP's BS detector lights up. He investigates accident site, sees skid marks and curb damage indicative of extreme reckless driving. -OP tells dealer to not touch car, he's gonna have someone else look at it. -other shop says there is lot of damage (can't remember the amount but it ends up being a total). -time passes. dealer refuses to do anything to help owner recover lost value of car. dealer's insurance is taking care of it. -BMW USA decides to help OP with cost differential between a replacement M5 and insurance payout. -OP finds reasonable replacement car, waits for BMW USA to pay up. -BMW USA changes it's mind. Now OP is left with no car and an insurance payout that will not cover the cost of another M5 in the same condition his was in before dealer wrecked it. -OP takes dealer to court to recover difference in cost. I think I got it all, minus the dealership apologist in the middle there.